Sam Turner, a retired art and writing teacher who served with the Arizona Education Association Innovative Teaching Techniques Cadre as a Trainer of Trainers in Facilitating, is a freelance writer. He's contributed to Arizona Highways and The Aviation and Business Journal. 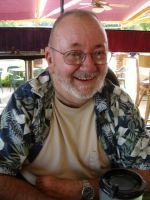 He teaches memoir writing, and he and his wife Phyllis have published This Might Help: A Three-Year Walk Through the Valley with the Compassionate Friends, a compilation of monthly columns published in the Tucson Chapter newsletter, Walking This Valley. Compassionate Friends offer guidance, comfort and hope for parents who have suffered the death of a child. Sam has been journaling for forty years and offers his most recent work, Living with the Semi-Rigid Penile Prosthesis, in hopes that, for those considering a procedure, this record might put them at ease. To read Sam's blog on the Men's Liberty website visit the link here. Send Email to: samwriting76 AT gmail DOT com (written this way to prevent spam).